The Listen Tech Universal Ear Speaker LA-401 is designed to provide high quality audio and the freedom of movement without cable snags. Universally styled to easily fit over the ear, it provides a comfortable, secure fit on either the right or left side. The open design allows the user to hear direct sounds and can be used with hearing aids. 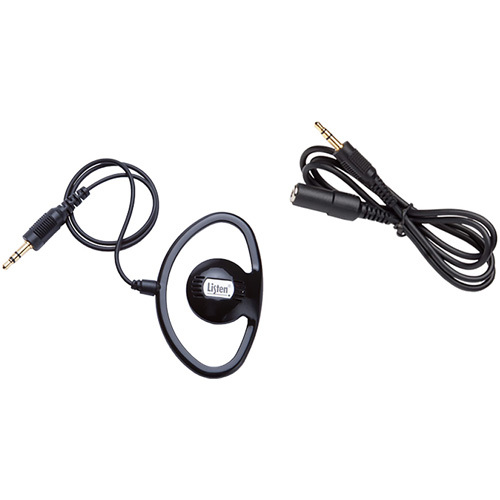 The ear speaker can be used with the inegrated neck loop/lanyard around the neck via the shorter connection cable or with the belt clip, or concealed in a pocket using the included 3.5 mm extension cable. The hard plastic can be easily and hygienically cleaned and reused using a Listen disenfecting wipe (LA-901 or LA-902). Open design allows the user to hear direct sounds and can be used with hearing aids.